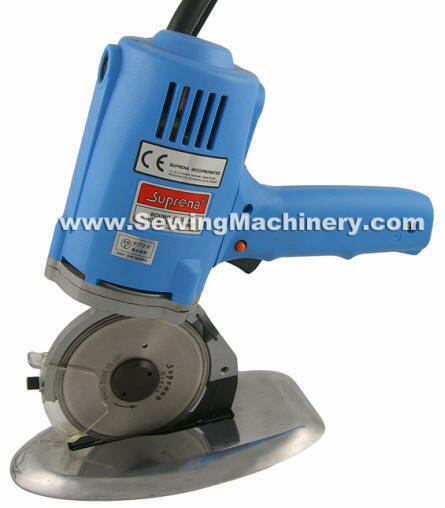 Suprena CR100A round knife cloth cutting machine with 100 mm blade and carbide tipped bottom blade. 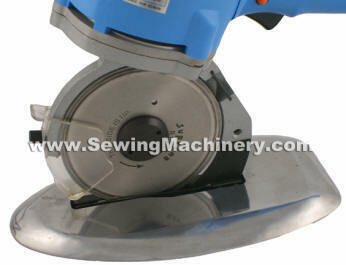 General purpose smaller sized circular knife cloth cutting machine for use in clothing and textile departments. Mounted on a roller base plate with extra thin knife support bracket for low cutting resistance and easy use. This CR-100A Actas II series is manufactured in Japan and supplied with a see-thru front knife guard. Supplied complete in makers box with tools & instructions. Extra thin base plate with rollers. Extra thin knife support bracket. 25mm maximum cutting capacity subject to material.